© Joanne Kamo. Photographed at Smith Oaks Rookery. Preferred Habitat: Lakes and ponds. Seasonal Occurrence: Very common March through September. Somewhat less common in winter. Profile by Gislaine Peters: The Neotropic Cormorant is medium-sized cormorant, at about 25 inches in length. Throughout the year they can mainly be found along the Gulf Coast of Louisiana and Texas as well as Central and South America. Occasionally they will journey up into the Great Plains region. They can be found along rivers, lakes, marshes and sea coasts. The adults are black with some olive gloss at the back and wings. The throat patches of the adults are dull yellow and have white border during the breeding season. They have a medium sized bill that has a hook at the tip. Immature Neotropic Cormorants are mainly brown on their breast and neck. They nest in groups called colonies and construct their nest in bushes and trees around 3-25’ above the water as well as on the ground of islands in bays. 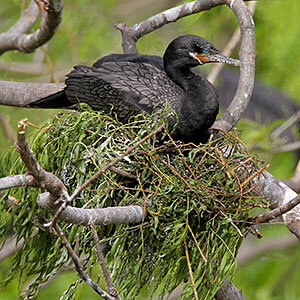 Unlike most waterbirds in Texas, the Neotropic Cormorant will nest in both late Spring and in Fall when prey availability is sufficient. Their nest are made of sticks shaped into a bowl. The clutch size of their light blue eggs can range from between 1-5, but is often between 3-4. The eggs are incubated by both adults for approximately 25-30 days. When the young hatch they are fed by their parents until roughly 11 weeks of age. At 8 weeks they are usually able to swim and dive. Neotropic Cormorants dive to catch small fish; their typical prey ranges from 2-5”. They will also eat tadpoles, frogs and aquatic insects. In Mexico they have been observed fishing cooperatively. They will form a line across swift-flowing streams and strike the surface of the water with their wings. This causes the fish to attempt to flee allowing the cormorants to dive and catch them. Neotropic Cormorants can often be seen year around at our Smith Oaks Rookery, come on down and see for yourself!